An Enterprise Application project (EAR) is a "composite" project, a container that will hold several other projects and deploy all of them at once in a .ear archive. So, let's do it. Create a new project of type "enterprise application project" called DemoEAR. For the moment, do not set anything, just click finish. We create this project first as when we will create the subprojects, we will speficy that they belong to this EAR project. Create an EJB project, call it "DemoEJB", indicate under "EAR Membership" that you want to attach it to the EAR project from step 1, notice that a DemoEJBClient project is automatically added too. More on that later. Add the EJB project in the build path of the dynamic web project as our servlets will call EJBs from the EJB project. So, you should get 4 projects: DemoEAR, demoEJB, demoEJBClient and demoWeb. You can check that everything is ok by looking at the properties of the DemoEAR projec, then look at "Deployment Assembly", you should see that the 3 other projects are in the assembly. Add a session bean stateless but this tome check the "remote interface" option, and indicate for the name of the bean " DemoSessionEJB" and for the remote interface you should see that the dialog proposes automatically DemoSessionEJBRemote. Add an hello world method to the bean, like we did at the beginning of exercice one, yesterday. At this stage, save all and deploy the EAR project to weblogic using right click on the server in the server tab of the Java EE perspective, and use the add/remote menu. It is important to deploy this project as we will need the JNDI name of the EJB we created, and this JNDI name is available from the weblogic admin console. You can do that by looking at the weblogic admin console, on the left, click on "base_domain", then "servers", then in the main page click on the name of your server, then in the main window you should have something like "JNDI tree"... Click on that, a new tab opens in which you can explore the names objects on your server. In the small tree, click on "weblogic" then you will find your application and the EJBs deployed. The "liaison name" of the EJB is the JNDI name. It should look like this: " java:global.DemoEAR.DemoEJB.DemoSessionEJB!sessions.DemoSessionEJBRemote "
A standalone client is just a Java project with a java class (with a main) that uses the remote EJB we created. The client project is just a Java project. Create a new project of type "Java project", name it "DemoEJBClientStandalone". Add wlfullclient.jar, a jar with all the client libs you need. This jar needs to be built once, using a command line interface. This is the procedure to build this jar: cd in the WEBLOGIC_INSTALL_LIB/server/lib, then run the command "java -jar wljarbuilder.jar". This will take 30s to build the client lib for your installation. At the end, you should find a wlfullclient.jar file. Add it to your build path. Copy this source code provided below, check that the JNDI_NAME is the same as the one you saw in the weblogic admin console/jndi tree. Redeploy the EAR project, just to be sure (right click on server, then "add and remove"). Run the standalone client project (as a "Java application"). Normally you should see in the console the "Hello World" message. As you saw, we could call the EJB from any external host, as long as we indicate the right URL for the weblogic server. This time, we will write a real application. A small bank account manager. Using the "Data Source Explorer" in Eclipse, use the "New" menu but this time to connect to a database named MyBank that does not exist. Put admin/admin as user/password, and check the "create database if needed" option. Once created Eclipse connects the database, that is, for the moment, empty. Connect this database to Weblogic 12c, follow the same procedure as we did in Exercice 1. If you do not remember, just look at the informations in this page: Weblogic / Java EE6 FAQ and Guides. Specify the database we are going to use: like in Exo1 with the manufacturers, double click on the persistence.xml file, then in the designer, use the "connection" tab at bottom, change "transaction type" to JTA, and enter the JNDI name of the database (it should be "MyBank" or whatever JNDI name you used when you connected the database to weblogic). 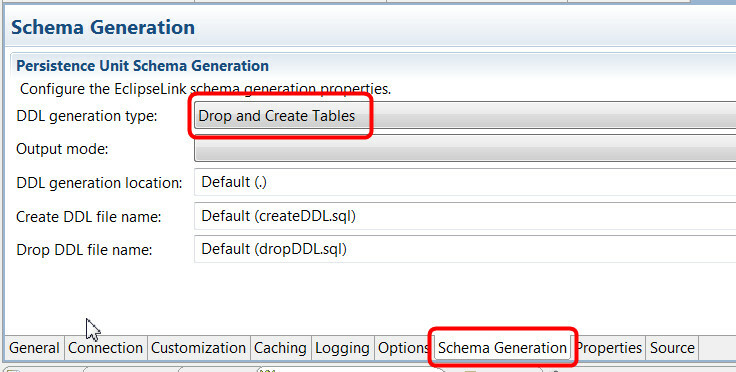 Specify that we want the tables to be created/updated automatically: go to the "schema generation" tab and change "DDL generation type" from "none" to "drop and create". This means that each time we are going to deploy a new version of the project, the tables will be dropped and re-created. This option is very useful when your entity classes (and consequently the schema of your tables) are subject to change. We will see further how to populate the database at deployment time automatically too. Use the New/JPA entity menu and add an empty entity class to the project. Put it in a package named "entities" and name it Account. Remember: a property is defined by getters and setters, so do not forget to generate/write getters and setters for id, name, balance. The @GeneratedValue annotation indicates that the PK is auto-generated, using any method, you do not care (AUTO). Other possible values = SEQUENCE, ID, etc. see the JPA course. You may also add some convenience functions like add(int ammount) or remove(int ammont) methods that will add or remove money from the bank account. Create a stateless session bean. Implement some methods for the CRUD operations like we did yesterday with the ManufacturerFacade. 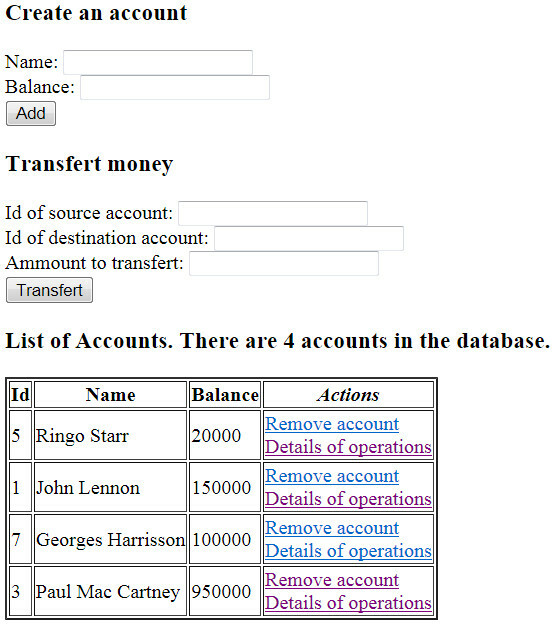 It is not important to have all of them but at least a create(String name, int balance) method so that we can create new bank accounts and a getAllAccounts() that does a select *. This is very similar to yesterday's exercice. The @Singleton annotation guarantees that only one instance of that bean will be created. The @Startup annotation indicates that this instance must be created at startup (deployment time), and the @PostConstruct annotation indicates that the annotated method should be called right after the instance of the bean has been created. In other words, this is a best practice for doing some init stuff when you deploy the application. As we are using a "drop and create" stategy table, this means that each time we deploy the application the tables are destroyed and re-generated. In order to work with some data, using the bean above, the database is always populated with some test data. Call the getAllAccounts() method and using a foreach loop, print in the console the 4 accounts. You may add some forms for deleting/updating/creating new accounts. Add a transfert(int sourceId, int destinationId, int ammount) method to the facade, that will remove some money from the first account, and add it to the other. You may also add a form in the JSP for entering Ids of Accounts and the ammount. Now, we are going to improve the design of our models. We are going to use an entity class for describing Operations that are done on a given by account. An operation can be an account creation, a deposit or a retrieval of money on an account. And of course, we wil define a 1-n relationship between the Accounts and the Operations. An account has a list of operations associated. Note that we are using the java.util.Date type, not the java.sql.Date. Here we do not have anything to do with SQL. We are working with Java objects ! An Account may have a list of Operations associated. The list starts always with the creation of the account. We add new operations to the list when an account is created, when money is added or removed from the account. See how we modified the add() and remove() methods, as well as the constructor. We also added a getter and a setter for the new "operations" property of Account. This time we would like to call methods from the AccountFaceEJB, from a client. Add a remote interface to this EJB, add classes nessary to the client so that it can compile and run. Try to display for example the list of Accounts.